Kicking is the defining action of soccer. Much is known about the biomechanics of a kicking leg, yet it is important to consider the kick beyond just the actual kick—how does the player approach the ball? What part of the foot performs the kick? What is the upper body posture, leg support, and pelvis? What is the influence of the soccer ball and footwear? Each of these pieces can influence a kick that may or may not yield a goal. The study highlighted takes a brief look at free kicks and is fun to think about respect to the science behind the game. Other informative studies are referenced here: (2-10) . 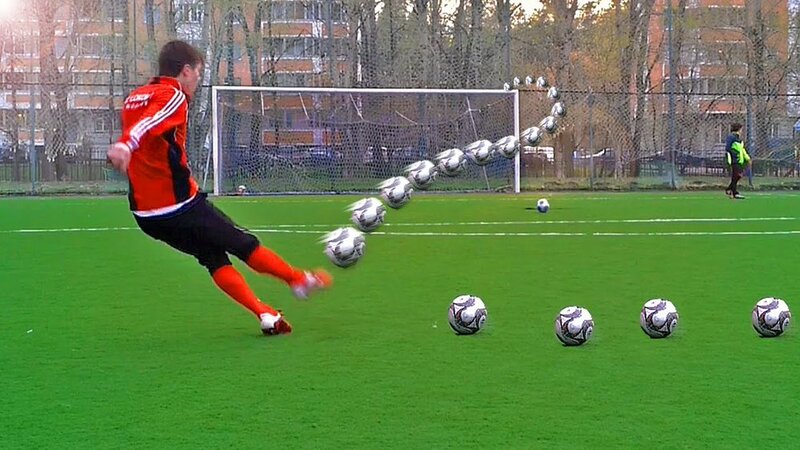 Skilled players perform an instep kick by approaching a stationary soccer ball from an angle. This is to angle the direction of ball flight. An angled approach is favored by players and self-selected approach angles around 438 have been reported(1). Players also prefer to use an approach distance that requires them to take a small number (2–4) of steps. An approach of this type generates a modest approach speed of around 3–4 ms–1. The nature of the approach appears to be important for performance but can vary between players. Ideal speed may depend on the frame and build of the individual. It has been reported that the placement of the support foot could be important for kick success, especially in free kicks. However, the authors of the review have identified no recent research that has reported data on this issue, even though it is known to be important to the type of kick produced(1) . The ground reaction forces made as the support foot contacts the ground have been reported for a maximal instep kick as 15–20, 4–6, and 5–6 Nkg–1 in the vertical, posterior (braking), and lateral (towards the non-kicking side) direction respectively. The upper body demonstrates some important characteristics of technique for free kicks. The non-kicking side arm is abducted and horizontally extended before support foot contact and then adducts and horizontally flexes to ball contact. This yields a shoulder rotation that are such that they move out of phase with pelvic rotation. This leads to a trunk twist during the preparation phase of the kick and untwist during the execution phase. Foot–ball contact lasts for less than 10 ms(1) , so high-speed imaging has proved to be invaluable for determining the precise nature of impact. Previous studies have used high-speed cameras (500 Hz) during a maximal instep kick which demonstrated that the ball on the foot was located on the distal end of the foot causing forced plantar flexion of the ankle joint. The current literature focuses on stationary kicking (free kicks) and the science behind it. Future work could entail the running motion of a free kick, i.e. Cristiano Ronaldo style, or from the run of play. More intricate models could account for corner kicks as well that take into account other players and the dreaded set piece header. (1) Lees A, Asai T, Andersen TB, Nunome H, Sterzing T. The biomechanics of kicking in soccer: A review. J Sports Sci 2010;28(8):805-817. (2) Plagenhoef S. Patterns of human motion: A cinematographic analysis. : Prentice Hall; 1971. (3) Robertson D, Mosher R. Work and power of the leg muscles in soccer kicking. Biomechanics IX-b 1985:533-538. (4) Griffiths I, Evans C, Griffiths N. Tracking the flight of a spinning football in three dimensions. Measurement Science and Technology 2005;16(10):2056. (5) Asai T, Akatsuka T, Haake S. The physics of football. Physics World 1998;11(6):25. (6) Effect of shoe mass on soccer kicking velocity. Proceedings CD IV World congress of biomechanics, Calgary, 4-9 August 2002; 2002. (7) Kellis E, Katis A, Gissis I. Knee biomechanics of the support leg in soccer kicks from three angles of approach. Med Sci Sports Exerc 2004 June 01;36(6):1017-1028. (8) Dörge HC, Andersen TB, SØrensen H, Simonsen EB. Biomechanical differences in soccer kicking with the preferred and the non-preferred leg. J Sports Sci 2002;20(4):293-299. (9) Dörge HC, Andersen TB, SØrensen H, Simonsen EB. Biomechanical differences in soccer kicking with the preferred and the non-preferred leg. J Sports Sci 2002;20(4):293-299. (10) Kellis E, Katis A. Biomechanical characteristics and determinants of instep soccer kick. J Sports Sci Med 2007 June 01;6(2):154-165. Older PostDrosophila, sleep, lifespan, and antioxidants!